It's time to once again join Erika at Bio Art Gal this month's host at Art Journal Journey with her theme New Year, New Adventures. 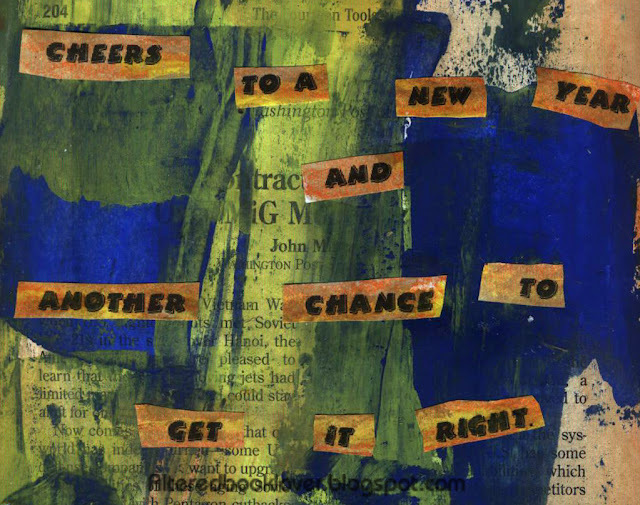 I'm raising my glass today to cheer this new year and new adventure. I just hope I learn to pack my bag better this year. For this spread, I began by laying down blue and yellow craft acrylic paint. The more the two colors spread on the page, the more green I got. I added some orange and white water soluble crayons to the page, and added yellow and orange water soluble crayons to the computer generated text. The bag was also colored using water soluble crayons to which I added a couple of stickers. 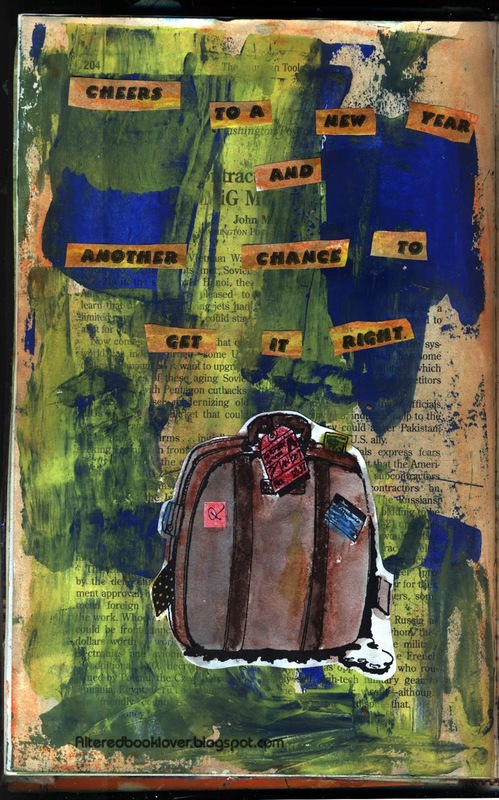 Thanks for joining Erika, Susi, and me today at Art Journal Journey. And thanks for your visit and continued support of my art. I am very grateful for your visit. The background itself is a piece of art and this bag looks so cool - and the idea for the page is just super! I wish you a wonderful year filled with just amazing adventures Ms.Elizabeth and say ♥Thank you♥ for being such a wonderful friend and Co-Admin! Happy Thursday - time really flies this week again! Boah! Everthing o.k. at the different doctors until now - thank you for asking! This is such a fun page Elizabeth, and it makes me want to pack my bags and go somewhere exciting! However, no big trips for me in the near future (that I know of!). I’m glad my card finally arrived - it seems like the mail is taking longer to get from A to B these days, especially between our two countries. I wonder if it’s getting stuck at the border, or just staff cutbacks on either or both sides. I bought those cards in the UK and the dots were already on them, so they were really quick to embellish. Hope you have a wonderful and creative day and that things are warming up in your area. what a great sentiment to start the year off right! Enjoy your new year adventures. This really works but I particularly love the bag -- the texture/shape/colors. And the background is really nice too! Packing a bag is a fine art, isn't it! Off to new adventures! 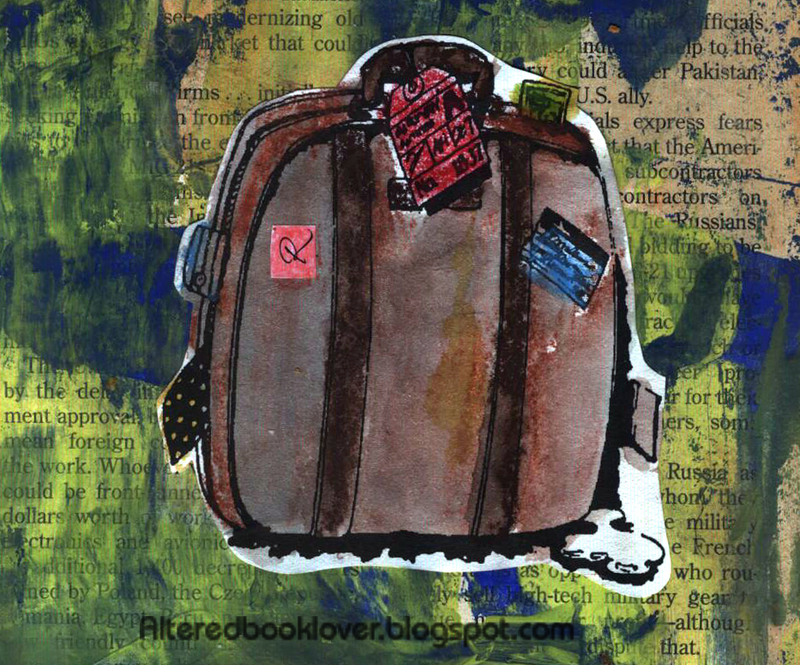 The bag looks well packed and good to go, its a fabulous page, the background looks great with the book page and paints. I think it looks like you had an adventure when you created this page. Wonderful page and quote. Each day is a new beginning. I thought your page looks great. My turn to catch up! Wonderful arty pages, and that museum must have been so inspiring Elizabeth.